Are you visiting or living in the Windsor, Ontario area? 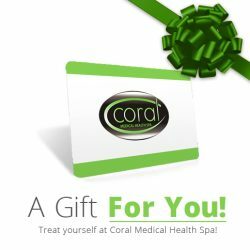 Treat yourself to one of Coral Medical Health Spa’s amazing Facial Treatments. Whether it’s the Coral Express Facial, one of our Intensely Therapeutic Facials, or any other facial from our day spa, you will leave your facial feeling like a million dollars. We are also pleased to announce that Coral Spa has 5 “Dermalogica Experts” on staff waiting to pamper you and provide the type of facial treatment you deserve! MicroZone Treatments provide an immediate solution to whatever might be plaguing your skin. Not meant to replace your monthly professional skin treatment, but instead, MicroZone Treatments can be a skin health “check-up” to help you maintain your best-looking skin in-between treatments. It’s quick, it’s simple, it’s effective! Choose between flash exfoliation, eye rescue, lip renewal, ageSmart, hydration boost, UltraCalming, or mediBac. The clear start facial is a 30 minute treatment ideal for delicate teen skin conditions. Clear Start products deep clean, degrease & decongest the skin while expediting the healing of inflamed breakouts. The formulas are tough on acne with gentle botanical extracts to balance sensitive skin. You want to step up your skin care experience but don’t have a lot of time. Coral’s Simply Dermalogica Facial is right for you. Following your skin mapping analysis with one of Windsor, Ontario’s Coral skin specialists enjoy the benefits that Dermalogica products have to offer and a relaxing facial massage to soothe your weary mind. When your skin care needs go beyond the basics or when you desire to give yourself a dose of much needed R&R, try a Therapeutic Facial Treatment. With this facial, Coral is able to help you reach new goals in your skin care regime with special targeted ingredients and the combination of steam. Facials are adjusted depending on the skin type that is treated, including; dry/dehydrated skin, dull looking skin, and oil/combination skin. Just because your skin may have a more advanced skin condition to treat, it doesn’t mean you don’t deserve to be pampered. Intensely therapeutic means it’s designed to help bring your skin closer to a state of balance. Specifically targeted to treat acne or severe sensitivity and redness. Intensely therapeutic facials include the MediBac facial, the Ultracalming facial and the Age Smart facial. If you find your skin to be oily, prone to break-outs, or to have mild acne the MediBac facial from Dermalogica is the facial you’ve been looking for. Ingredients such as salicylic acid, retinyl palmitate and benzoyl peroxide help exfoliate and eliminate bacteria deep within the pores; while ingredients such as green tea, licorice and chamomile calm and sooth irritated skin. It has been estimated over 60% of Canada’s population battles with skin sensitivity, which can include itching, burning, and rosacea-like symptoms. The Ultracalming facial from Dermalogica has become the leading treatment and home care solution to combat these common concerns. Ingredients such as Acetyl Tetrapeptide-15, Boerhavia Diffusa (Red Hogweed) Root Extract, and Avena Sativa (Oat Kernal) Extract have been clinically shown to calm and sooth irritated skin in a matter of minutes and prevent future flare ups from occurring. Sensitivity no more! The ultimate in facial indulgence. Not only does this facial boast four different massages but amazing age-prevention technology offered from the laboratories of Dermalogica to help treat and prevent the signs of aging skin. Vivier chemical peels are a revolutionary breakthrough in chemical exfoliation treatments. This systematic approach is based on established research in combination with new scientific discoveries. These chemical peels contain unique and advanced formulations providing potent concentrations with high levels of active ingredients to clinically transform the skin. Vivier chemical peels provide the ability to customize treatments for each individual client to achieve subtle, gradual or astonishing transformations. These chemical peels will help properly exfoliate the skin while repairing, rebuilding and renewing to assist during the healing and regeneration process. Visit our Chemical Peels page for more information and prices. To view our facials specific to men, please visit our Men Zone.